HELO is AJA’s new H.264 streaming and recording stand-alone appliance. HELO brings both SDI and HDMI I/O into a single appliance with the ability to simultaneously stream out to your Content Delivery Network (CDN) as well as encode and record beautiful H.264 files to either SD cards, USB storage or network based storage simultaneously. 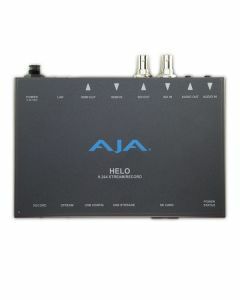 HELO from AJA is a stand-alone H.264 streaming and recording appliance. It comes with SDI and HDMI I/O with simultaneous stream out to the Web Content Delivery Network (CDNs) and can also encode or record onto SD cards, USB Storage, and Network-based storage. To simplify on-site workflows and usability this product offers front-panel buttons for recording, streaming and browser based UI, offering easy configuration and control. The AJA HELO is slight and easily manoeuvrable. It is simple to control, any device can be connected via 3G-SDI or HDMI to record H.264 files and stream. The 24-bit audio at 48 kHz embedded in either signal ensures stability in synchronizing. USB connection and robust web browser based UI make for an easy setup and also configure CDN connection. The HELO’s Ethernet connection and AJA’s eMini-Setup mean it is simple to set up, configure and update streaming. AJA HELO’s H.264 based encoding not only ensures striking video but avoids excessively large file sizes. It’s the perfect solution for a busy schedule: live streams, podcasts and webinars from SD to HD 720p-1080p60 are not a problem. Additional connections on included breakout cable.